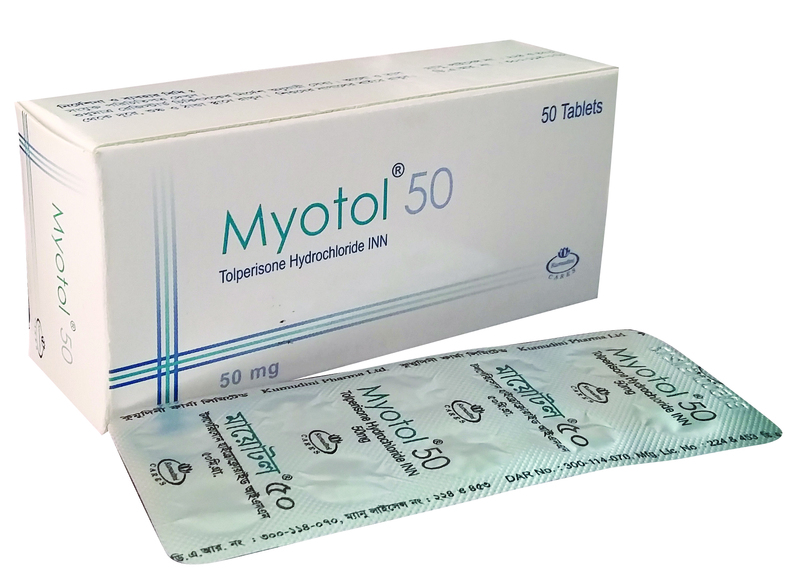 Myotol 50 Each film coated tablet contains Tolperisone Hydrochloride INN 50 mg.
Tolperisone Hydrochloride is a centrally acting muscle relaxant which acts on the central nervous system. It effectively reduces muscular hypertonicity, improves peripheral blood flow by vasodilatation and reduces pain. the pyramidal tract, multiple sclerosis, myelopathy, encephalomyelitis etc. ), Hypermuscular tension, muscular spasm, muscular contracture, rigidity, spinal automatism and discopathy. Obliterative vascular diseases (obliterative arteriosclerosis, diabetic angiopathy, obliterative thromboangitis, Raynaud's disease, diffuse scleroderma) and disorders due to injured innervation of the vessels (acrocyanosis, intermittent angioneurotic dysbasia). In individual cases post-thrombotic venous and lymphatic circulation disorders, crural ulcer. Children (from 3 months to 6 years): 5-10 mg/kg/day in three divided doses. Children (from 6 to 14 years): 2-4 mg/kg/day in three divided doses. Sometimes, muscular weakness, headache, nausea, vomiting and rarely hypersensitivity reactions may occur as side effects. In case of children, the prescribed dose and duration of treatment should closely be observed. Concomitant use of methocarbamol with tolperisone hydrochloride has been reported to cause disturbance of visual accommodation.